Sony Ericsson will apparently be adopting a new naming scheme for their various mobile handsets, however they are still to keep the letter and three number style, as you can see by their chart. As before the first letter will denote the series such as W = Walkman, C = Cyber-shot, and X = Xperia and so on. 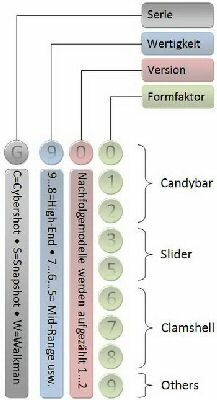 Next comes where the handset is placed within the overall range so like 1 is lowest with 9 being the highest, then comes model version and followed by form factor such as 0-2 = candy-bar, 2-5 = slider, 6-8 = clamshell, you get the picture. Well that’s how it’s supposed to work, and I suppose companies do need a system by where they can name the product; seems a bit of a long winded way about it to me though, and somewhat confusing.